How do I edit a video to make it shorter? Select a video in your Library (one that is on your PC, not only in RealCloud). In the taskbar at the bottom of the player, click More > Trim. 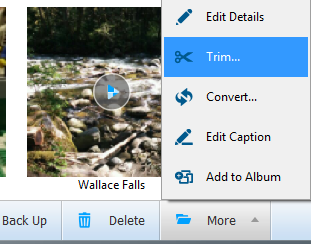 RealTimes Trimmer opens your video. By default, the video display is the native aspect ratio scaled to 480px wide. For a larger view, drag any part of the window. Find your start point. You can use the following selection methods together or separately. Use the cursor to grab the handle and move it to the section you want. Click Play to play the video. Click again to pause it. 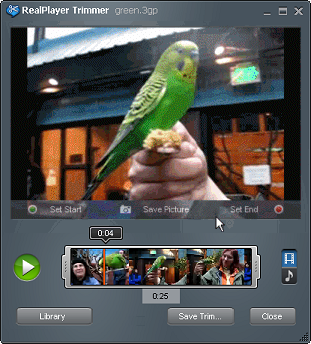 Use the cursor to grab the playhead or the time marker and move it to fast-forward or reverse through the video. Move the cursor over the video. Click Set Start. Find your end point. Move the cursor over the video. Click Set End. Find the frame you want. You can use the following selection methods together or separately. Move the cursor over the video. Click Save Picture. A Windows "Save As" dialog opens. Name the photo and choose a save location. Note: It is not possible to trim VOB files at this time. The smallest unit that can be trimmed is a key frame. The size of a key frame is determined by the content producer, not by RealTimes Trimmer. Click Close to close RealTimes Trimmer without saving any changes. Click to view the audio waveform in the progress bar instead of keyframes. You can trim to a section of a item, but you cannot connect two separate sections. When you share a trimmed video, it will always upload to your Cloud storage. You can use just the handles to set your start and end points. The length of the trimmed version of the item displays just below the area between the handles.